Last year it was Goldman Sachs telling clients to "dump your gold" (only to become the biggest buyers of the precious metal in the following quarter). Just last month, Morgan Stanley advised clients that 'gold will not see $1300 again'... and today, Bank of America joins the crowd as Macneil Curry advises "It is time to sell Gold" (to BAML we presume?)... as the range trade of the past month is completing and the downtrend is set to resume. It is time to sell Gold. The range trade / consolidation of the past month is drawing to a conclusion. Further gains should not exceed 1315.70 (May-05 high) AND CAN'T EXCEED the Mar-14 high at 1331. Downside targets are seen to 1215. 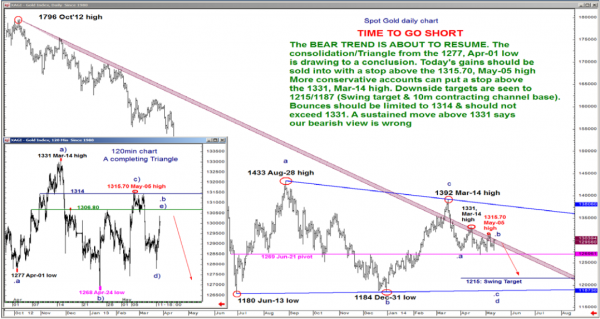 Sell Spot Gold at market (1300), risking 1325, targeting 1215, potentially below. My personal Opinion = Create Short positions only below 1268.